Population: 3,083, formerly called Ilon and Bethalla by Crusaders (Roman-era). 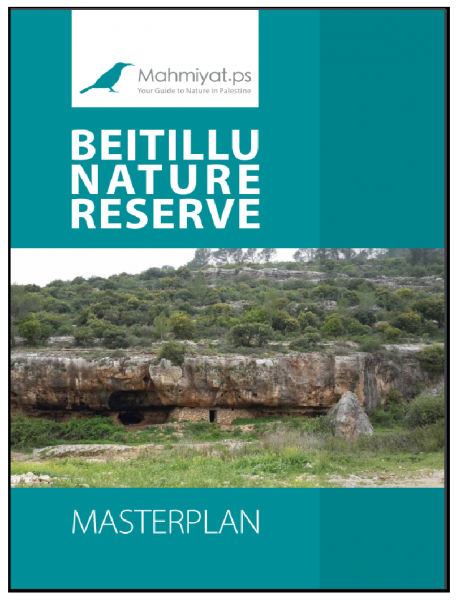 Beitillu Nature Reserve (Wadi Janatah) is located 19km north of Ramallah in the Al-Ittihad (الاتحاد) Municipality, referred to by locals as the “The Union” of three towns: Beitillu, Deir ‘Ammar, Jammalh and it is nearby Ramalla. It has an area of 3.35668 km2 (3357 Dunams). Driving on the outskirts of Ramallah, passing by local villages, you will encounter the “fellahin” (فلاحين ) pace of life. Palestinian fellahin are a group of traditional agricultural laborers living and working in orchards and fields. The rows of olive trees, fruit orchards, and rolling hills might remind you of similar Mediterranean landscapes, such as Napa Valley in California, or Tuscany, Italy. The residents of Beitillu offer traditional hospitality upon encountering visitors. Arriving in the village of Beitillu, age-old architecture, such as traditional homes and religious relics will fascinate you. In the center of town, the citadel of the newly renovated mosque serves as a guide as you venture into the wilderness. Amidst the freshwater streams that divide the landscape of Beitillu, there are many quiet trails, buzzing with the sounds of butterflies, birdcalls, and the gentleness of your own footsteps. In the bottom of the valley, the orchards of pistachio trees and orange groves grow adjacent to the trail. On the descending slopes, olive trees and small forests of non-native eucalyptus provide shade for picnicking. It is possible to gaze in the distance from one village to the next, witnessing the unique differences of the local villages, for example, the nearby Ein Arik, 7km west of Ramallah on the way to Beitillu. Ein Arik is home the tallest citadel mosque in the West Bank and serves as a visual landmark. Walking in these villages, the architectural ruins of Byzantine, Ottoman, and Crusader period are often encountered: ancient water cisterns, church ruins, and traditional structures open for exploration. Ask a local. Tread lightly. On the edge of Beitillu is the Hashimite Forest, which borders Route 450. The iron gates of the forest are remnants of British Mandate-era conservation plans. Along the edge of the forest are “Natufian” caves, marked by charcoal fires. Where there are natural resources humans usually use them in a more or less sustainable way. To keep resources available also for future generations sustainable use is very important. Beitillu has springs used for irrigation and for household use during summer. Also wild plants are used mainly for household use such as Jerusalem sage, Biblical-hyssop, common mallow, Palestine Arum and various edible mushrooms. Grazing and Fuel wood (1% of fuel use) is very limited because of strict enforcement of reserve. Beitillu is important as a recreation area with more than 200 visitors per week. Fire , unsustainable tourism development (disturbance, littering), unsustainable hunting, threats for effective management arising from threatening/aggressive behavior of settlers from nearby Israeli settlements, intensive agricultural use in vicinity causes chemical pollution of water bodies and threatens freshwater biodiversity in the area, conversion to agricultural land (lower parts of the site).